While the end of Season 1 of Castle Rock leaves us with more questions than we had at the beginning of the show it is a solid attempt to create a “Kingverse”. Hailing from the mind of Stephen King, Castle Rock is a town used in most of his novels, and now with the resurgence of Stephen King films, Sam Shaw and Dustin Thomason took the opportunity - with the blessing of the master of horror himself- Stephen King, to create an Anthology Series entitled Castle Rock, with a cast of actors from some of his other films. The show follows the lives and stories of residents in the fictional town of Castle Rock, Maine. The series premiered on Hulu on July 25, 2018, and has been a success since. Crafting an original story it uses some characters as well as lore from his other works. Now, you can purchase the first season on 4K, available January 8. Henry Matthew Deaver (Andre Holland, Moonlight), an attorney, receives an anonymous call about an imprisoned man who is locked in a cage below the Shawshank State Penitentiary. "The Kid" (Bill Skarsgård, It), as the young man is named, seems to know Henry so the attorney sets out to find out who he his and why he was hidden underneath an abandoned cell block of the prison. Not only does Henry have to deal with this mystery, but his adoptive mother, Ruth (Sissy Spacek; Carrie), is suffering from dementia. We see Henry reluctantly decide to stay on in Castle Rock for the time being to sort all of this out. The cast also includes Melanie Lynskey (Two and a Half Men) as Molly Strand, Jane Levy (Suburgatory) as Jackie Torrance and Terry O'Quinn (Lost) as Dale Lacey, the Shawshank State Penitentiary Warden. The cast certainly helps craft and create the show into the masterpiece that it was. Spacek, Holland, Skarsgård, and Lynskey give performances that most certainly should win Emmy Awards. This is not a show that is one dimensional, but as true with most Stephen King works, relies heavily on the characters and in turn, Stephen King's movies and television show primarily rely on the actors portraying them. In this case, the cast did this to perfection. What makes Stephen King's novels and most of his films unique are the fact that the stories focus on character development, and it is through this development we learn about their fears as well as the monsters "that go bump in the night". Creators Shaw and Thomason tried to follow his formula as close to the letter as possible while throwing some nods to the style of executive producer JJ Abrams. This made for a tale that at times was a bogged down with exposition compared to most television out there. However, the pay off by the end of season one made it all worth it although it left us with a huge cliffhanger. Presented in 1.78:1 aspect ratio, Castle Rock has never looked more pristine than on this 4K release. Black are deep, colors, while muted, are vibrant at times, and the depth and clarity of the picture is hard to surpass. The English 5.1 DTS-HD MA soundtrack presents crisp dialog that can clearly be heard on the center channel while the special effects make great use of the surround speakers. The only thing that would probably improve this presentation if they were able to add height audio through Dolby Atmos. 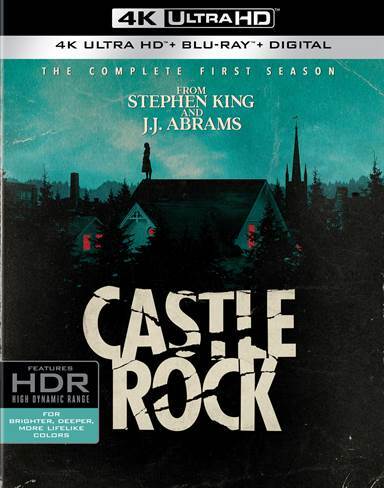 The 4K Castle Rock Season 1 set includes a UV copy of the show presented in only 1080p as well as a Blu-ray copy of the series. Each disc of the series contains bonus features that give you an in-depth look into each episode along with two featurettes saved for Disc 2 of the 4k and Blu-ray sets respectively, called Blood on the Page, and A Clockwork of Horror: Merging the styles of Stephen King & J.J. Abrams. While the end of Season 1 of Castle Rock leaves us with more questions than we had at the beginning of the show it is a solid attempt to create a "Kingverse". It will be interesting to see if they stay in Castle Rock in season two to fully conclude the first season or jump over to the Overlook hotel as the final scene in Season 1 suggested. Either way, this was a solid first season and if you are a fan of King, amazing 4k transfers, or just good television this is one you should pick up. Download Castle Rock from the iTunes Store in Digial HD. For more information about Castle Rock visit the FlickDirect Movie Database.